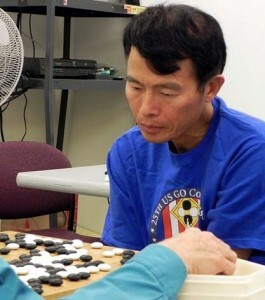 Jian Liu 1d (r) topped the NOVA Congress Tune-up Team Competition in Arlington, VA on June 26. The Great Falls Go Club C Team — Ching-Sung Chin 3k, Jerry Chen 4k and Ethan Hsiao 33k — won the team competition, a new feature of the quarterly 4-round handicap tournament in which 3-6 players can form a team and the team with the most wins per player wins $100 cash prize. The team competition — sponsored by NGOL.US — inspired players to check team scores frequently and come up creative team names like Muse, Richmond Rogues and Bamfs. The NOVA and GFGC-A Team were close behind with seven wins each. Click here for more photos. Winners were awarded a NOVA trophy and/or five hours of Guo Juan 5P’s audio go lessons. After serving as a Tournament Director for nearly 20 years, Allan Abramson retired as an TD earlier this year, but coached Garrett Smith, NOVA Go Club president and Edward Zhang to run this NOVA tourney. New Asia Market catered lunch from Rockville, MD, and players liked the combo of lunch box and bubble tea. Winners Report: 1-6D, 1st: Jian Liu 1d, 2nd: Daniel Chou 6d and Ray Hunley 1d; 2-3K, 1st: Hua Lin, 2nd: Ching-Sung Chin 3k; 4K, 1st: Kevin Chin, 2nd: Jerry Chen; 7-12K, 1st: Gurujeet Khalsa 9k, 2nd: Joey Phoon 7k and Garrett Smith 12k; 15-20K, 1st: Marcus Phoon 17k, 2nd: Tristan Tran 17k; 21K+, 1st: Ethan Hsiao 33k.